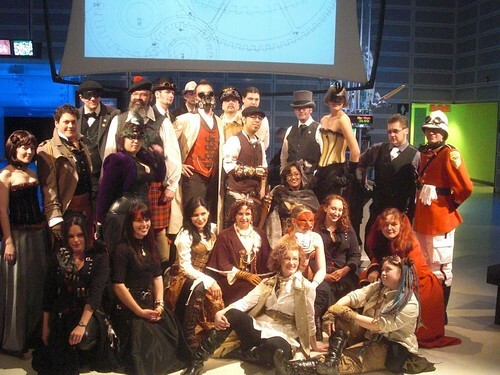 Last night I went to the opening of a new exhibit at the Ontario Science Center: The Difference Engineers, a ribbon cutting ceremony and party about Steampunk, that awesome fusion of Victorian era clothing with steam powered technology and lots and lots of useless gears and stuff :-). Facebook says there were 150 people in attendance, which sounds about right to me. There were perhaps 50 people in full costume, including lots of awesome costumes and props. I had a great time catching up with some friends and taking photos of the awesomeness. And the actual exhibit was really well done as well, I especially enjoyed the "alternate history" timeline that formed the middle of the exhibit. I also had a fun time making my costume, which was assembled from a variety of sources including Exile (costume shop here in Kensington Market), Value Village (used clothing retailer), Courage My Love (bead store, kind of) and of course my own efforts in creating a Steampunk Heart Spark, which got a lot of attention :-). Check out all the costumes in my complete flickr set.